In the summer, I excitedly anticipate the release of classroom decorations to the Target Dollar Spot. 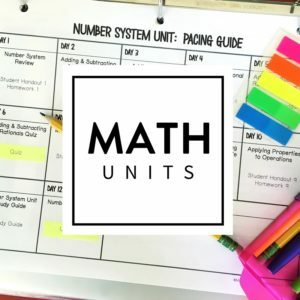 Since that is weeks away, I thought I would use my energy to create a list of supplies that every math teacher should have in their classroom. 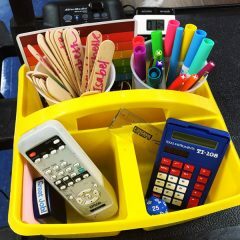 All of these items can be found in use in my classroom any given day (with the exception of the whiteboard clipboards which I will be purchasing this year). 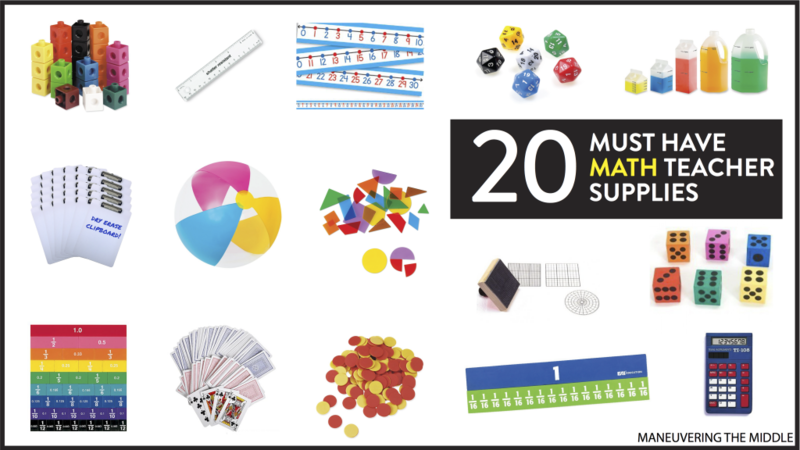 Here are 20 of my favorite must have math teacher supplies. 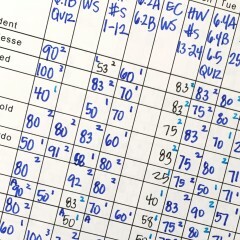 A 6 inch ruler is great for connecting two points on a graph especially if you are a perfectionist. It’s translucent, so students can see what you are doing, but it is small enough to live in your pen cup without tipping it over. 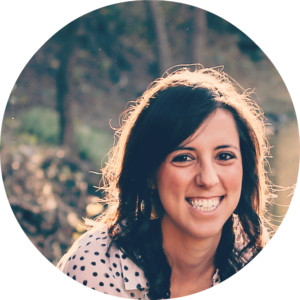 We all have those lessons with complicated multiplication and division, but the skill you are teaching has nothing to do with multiplication or division, so you bring out the calculators. I like to have enough that each partner set has one. The 5th grade teacher and I share a set since we rarely need them at the same time. This might be the item that I am most excited about! These whiteboard clipboards would allow students to travel with their papers on the clipboards to stations and then use the whiteboards at those stations for extra work space. I’m already obsessed! My nephew received these magnet tiles as a birthday present, and as I played with them, I realized how helpful these would be to students’ conceptual understanding of nets and three-dimensional figures, everything from spatial reasoning to understanding how formulas are derived. These tiles have fractions on one side and decimals on the other side. These are great to show equivalent fractions in your small group and can be super helpful when you are introducing any fraction or decimal operations. Fraction strips are similar to tiles but these are magnets! Great for the whiteboard. One year, I tried to use counters that I made from paper. Those lasted one day. Plastic or foam counters are the way to go. I use these to introduce addition and subtraction with integers. They can also be used in place of a coin when you get to probability. I use snap cubes to teach volume. There is something about proving why a formula works to students that shows how magical math really is. I use the formula to calculate the volume of a rectangular prism, and then I pull apart the shape to count the cubes that made up the shape. 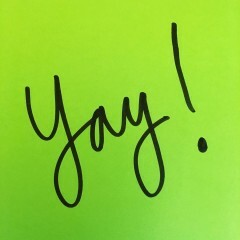 The stamp is especially helpful in the upper middle school grades. If a student needs to sketch a coordinate plane, they can whip out the stamp, and they have a perfect graph. I use the graph sticky notes often during my statistics unit. 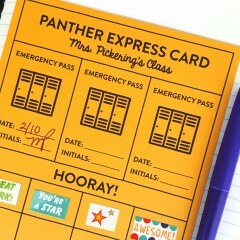 I also will pass these out if students need a little extra space for one or two problems. If you have taught middle school, then you probably know that yardsticks are not to be trusted in the hands of middle schoolers. Measuring tape does the job and is much easier to store. I like to use these to explain composite shapes. You can also use them to show how the triangle formula is derived. Algebra tiles are perfect for your expressions and equations unit! You can easily use these to explain how to simplify expressions and visually see the combining of like terms. When you get to solving equations, I liked to have students write with a dry erase marker on their desk as we did the step visually with the tiles. Dice are a great tool to have in the classroom. 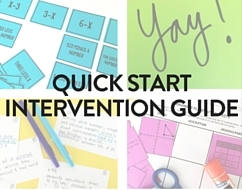 Not only can you use them while teaching probability and statistics, but you can also use them to practice quick math and spice up a worksheet. Plus, they are quiet. These dice have a variety of numbers on each side. Students can use these dice to roll a set of numbers where they will have to find the greatest common factor or least common multiple. My student desks are numbered, so I use my die to cold call on students. Playing cards can be used in a variety of ways. I used them this year to play the Integer Game. One year I had my students play 31-derful as an icebreaker on the first day. I purchased a set, laminated them, and hole punched them to store on a hook, and my students used these all the time. For two entire units, these stayed out on student desks. I did have to set some expectations, but it was worth it. 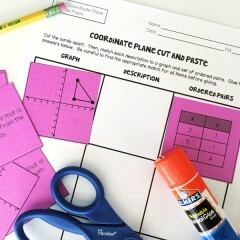 Colored tape can be used to tape a coordinate plane on the floor or enlarge a number line. 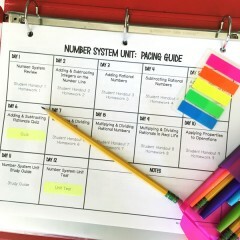 You can see how you can use tape for an ordering numbers activity here, and how I use it to set up my whiteboard to organize our daily schedule. Write some math facts on this ball and have students toss it around. Whatever problem is facing the student when they catch it is the problem they need to solve. You can have this on hand, and whenever students are feeling wiggly, use this activity as a brain break. Whenever I teach converting units of measurement, I like to have the actual units on hand. You could buy a set to have in your classroom, or you can bring pieces from your kitchen. 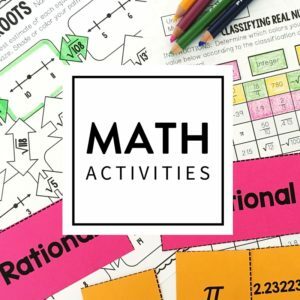 What supplies do you use in your math classroom? Any others that you would add to this list? 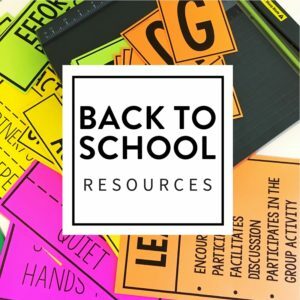 This list is wonderful and I have purchased many items from your list and use often in my 7th grade math classroom. My favorite is the dry erase clipboards! I was just wondering if you have an updated list for 2018-19? Thank you! I am so glad you found it helpful! We are adding that to the list of blog ideas for this summer, so stay tuned! Thanks for the page. I taught high school math for 20 years and just finished my first year of grades 5-8. Yikes! What a paradigm shift! I am making my wish list for next year and found your page. I will be reading much more. I honestly have no clue how to effectively use the manipulatives in my classroom. Teaching high school geometry I found these fillable geometric solid and a box of of play sand to be a great way to demonstrate the relationship between the volumes of various solids. For me they are a must have. With enough sets I could use it for group activities or centers. By the way, they are less expensive elsewhere. Brilliant! We will have to add those to a future list. Thanks for the idea! Have a great Holiday and we’ll see you in the new year!